Being involved in school activities increases a student’s ability to learn and grow. Our school offers a variety of clubs and activities to help students and their families get involved. Here are some fun and rewarding things to do at Lee Academy. The National Honor Society (NHS) and the National Junior Honor Society (NJHS) recognize and honor high school and middle school students who excel in academics and who meet the respective organization’s standards for excellence in the areas of service, leadership, and character. We sponsor and participate in a variety of activities and events to develop our members’ leadership skills and to provide community service. Student government gives young people the opportunity to learn leadership and responsibility at a young age. 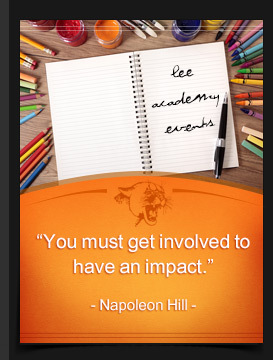 As we believe these are important life skills to develop, Lee Academy offers students the option to participate in student council. In this program, students work together to plan and carry out school and community events as well as fundraisers and service projects. The Yearbook Club is comprised of faculty and students working together to create our school’s annual yearbook. These staff members and students plan everything from the design of the book to the layout of individual pages. Yearbook offers students the opportunity to see the results of hard work and dedication while being social and making new friends.